I am sure you have heard of A Journey Through Learning Lapbooks but if not let me introduce them to you. They make educational and professional quality lapbooks for all subjects and ages. There are stand-alone lapbooks and also lapbooks that go along with specific homeschooling programs. All of the lapbooks can be purchased in downloadable format but if you prefer you can also purchase many of them on CD, in printed format and even assembled. If you have NO clue what lapbooking is visit the website and scroll down to the middle of the page. I was approached by A Journey Through Learning and presented with a few lapbook options to review. 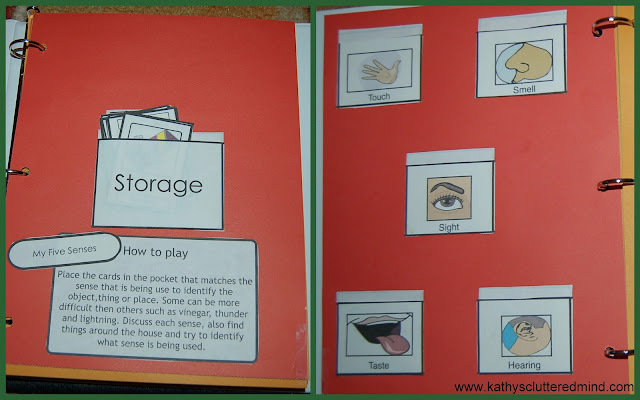 I choose the Preschool File Folder Games even though I currently have a son in Kindergartner and daughter in 1st grade. I had a feeling that my very tactile son would love the Preschool File Folder Games from A Journey Through Learning and I was so was right. Actually even my daughter loved these games and they were great reinforcement for her. Guess what else there is a giveaway too so make sure you read all the way down to the bottom! Now we do our lapbooks a little differently...we use binders. And file folder games are no exception. So after I downloaded the file I printed everything out and then began cutting. This is the most time consuming part but let me tell you it is totally worth it because your children will have hours of fun playing and learning. To construct the binder format I simply take a piece of card stock or scrapbook paper and 3 hole punch it. Then I take an envelope or use the game instructions to make a pocket and glue it to front of the paper. This where game pieces can be safely stored. For smaller games like the 5 Senses Game I just used one piece of paper and affixed the game board pieces on the backside. To turn the instructions into a pocket I put a thin line of glue only on the left and right sides and the bottom. Leaving the middle portion and top unglued. This works well when there are only a few game pieces. If there are a large number of game pieces I use an envelope. Left photo is of the front and right picture is of the back. 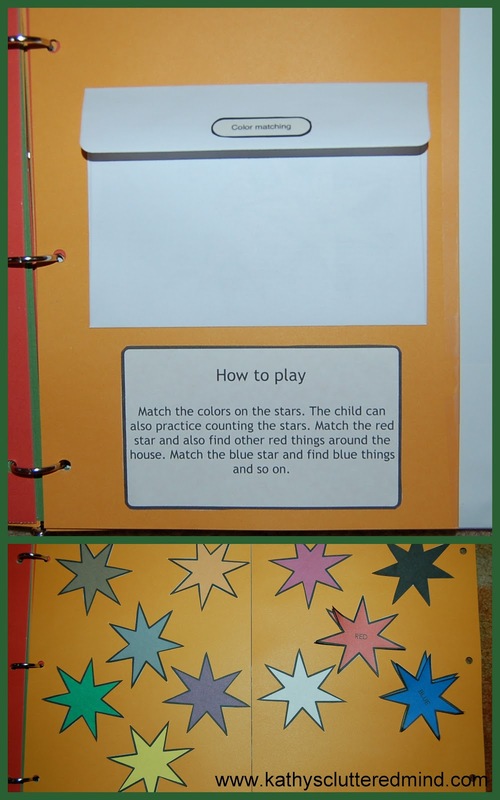 For larger games like the Color Matching Game I took two pieces of hole punched paper and tapped them together at the non hole punched side using wide tape. I then affixed the envelope or instruction pouch on the outside and then on the inside I affixed the game board pieces. Top photo is front and bottom photo is the inside. I love that my son will just pick up the binder at any given point throughout the day and start playing and learning. Sometimes he keeps the games in the binder other times he takes them out. I keep them stored on our bookcase where he can easily just grab them whenever he wants. These are also great for carschooling days or long trips. 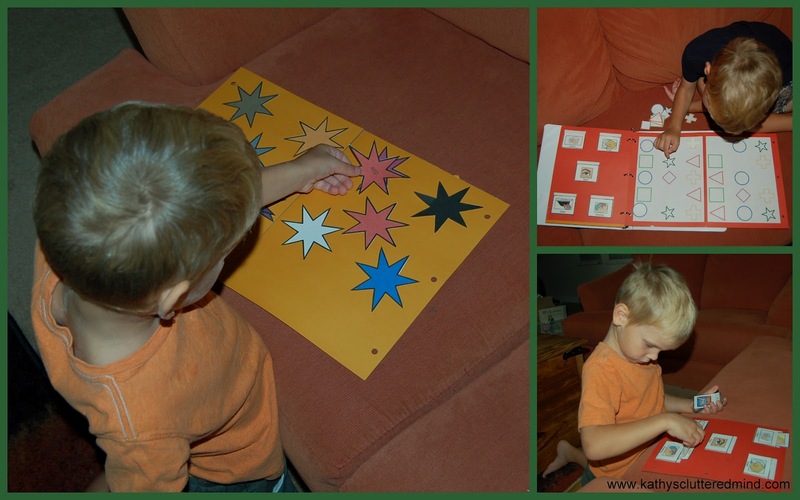 These games are great for tactile/Kinesthetic learners and both boys and girls. I think children ages 3-6 would have fun with these games. For older children you can adjust the rules a little to make the games harder. For instance with the ABC games you can have kids say the letter sounds when they match the letters up. If you want to make the games more durable so they hold up for future or younger siblings you can laminate all the pieces. Because we will only be using these this year I decided to save my laminating pouches. And these come in both color and black and white. Children who enjoy coloring can have extra fun by coloring all the pieces. I love these games they are super duper fun. I liked the Chicka Chicka Boom Boom Tree Game and the Color Game. Sometimes mommy and Gwyn play with me sometimes I play by myself. The Preschool File Folder Games and other lapbooks can be purchased from the A Journey Through Learning website. Prices vary but the Preschool File Folder Games are $10.00 for the instant download and available in color or black and white. 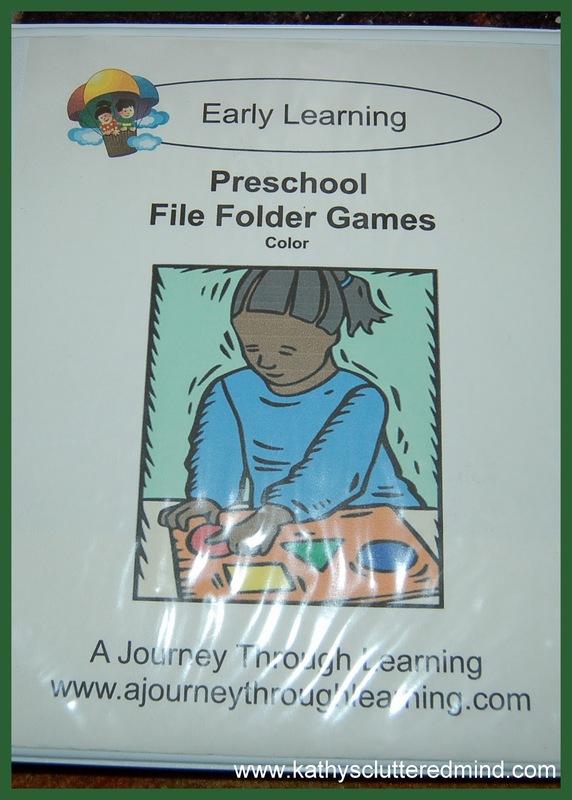 A Journey Through Learning has graciously offered to giveaway 5 Downloads of Preschool File Folder Games. So that means there will be 5 WINNERS! Only the first entry is mandatory. Other entries are optional and give you extra chances. This giveaway is not affiliated with Facebook in any way. The winners will be posted on the blog and will be emailed. Your email address will be provided to A Journey Through Learning so they can email your download to you. 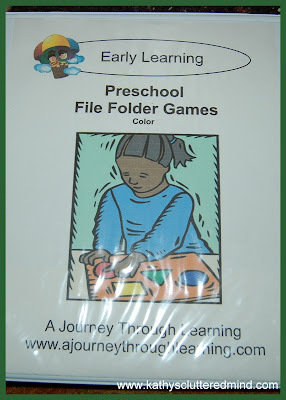 *Disclaimer - I received a copy of Preschool File Folder Games in return for my honest review. Please note that prices indicated in the post are subject to change. I was not compensated for my review and all opinions are our own! Many of the links found on my side bars and in my blog posts are affiliate links. As a result, I might get paid money and I will most likely spend the money on homeschool supplies. I do what you do. I like the flipbooks and activities for the one who learns well that way, but the lapbook format is a little tough to store, so we do binders. Yes we do a lot of lapbooking. Have tried once, going to try again. We have a habit of losing steam during the week. working on that. My little boy loves lapbooks! We've done two so far - one on spiders and one on feelings. Where have I been?!? Never heard of lapbooks, but definitely looking into them. Thanks for the info and the giveaway!